Bushnell never disappoints when it comes to the manufacture of golf GPS, and this is one of the reasons why I tried out the Neo iON. It builds on the success of the Neo XS, and although it does not have any new outstanding features, everything seems to work better than its predecessors. The battery life is very impressive, and you can be sure that it will last for three rounds. Bushnell never disappoints when it comes to the manufacture of golf GPS, and this is one of the reasons why I tried out the Neo iON. It builds on the success of the Neo XS, and although it does not have any new outstanding features, everything seems to work better than its predecessors. The battery life is very impressive, and you can be sure that it will last for three rounds. Another thing that is amazing about it is the short measurement feature because at the press of a single button you can be able to tell how far you hit the ball. Preloaded Courses: This watch comes with more than 35,000 preloaded courses from 30 different countries. Battery: It has a rechargeable battery that can take you for up to three rounds on a single charge and it can also last for up to two years when using it in watch mode. Auto Course/Hole Recognition: The watch will detect the golf course automatically and also advance to the next hole meaning that you will not have to do any manual advancing. Shot Measurement: This machine has a shot distance calculator that will let you know how far you hit the ball. And the good thing is that you only need to press one button to measure your shot distance. In the Box: Neo iON comes with a sync and USB cable for charging and for updating the courses. There is also a quick start guide to help you out in case you have trouble using the watch. Distances: It will give you easy distances to the front, center and back of the green and this means that you will have all the yardages that you may need. 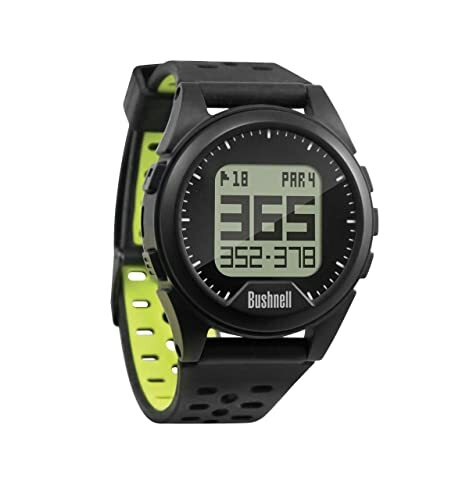 It is hard to narrow down a few benefits that you get from using this GPS watch because it will change your golfing experience entirely. However, the biggest advantage that you get from using the Neo iON is consistent and reliable information as and when you need it. It is not top of its class by chance because every golfer who uses it always has some positive things to say about this watch. Other benefits that you get include the ease of use and the ability to sync data to your computer for future reference. This watch as exceptional and impressive course coverage. Just like most other devices from Bushnell it is very easy to use. There are no download or course update fees. Neo iON is one of the most accurate GPS watches on the market. Battery life is good especially if you compare it to others. It is very accurate, and so you can rely on the measurements that it provides. The design is sleek, and the watch is also very comfortable in your hand. It does not have all the hazards and bunkers. Occasionally the yardages are off when playing particular courses. Some customers complain that they have challenges when syncing data. This GPS watch is quite expensive if you compare it with other brands. Neo iON builds on the success of its predecessor the Neo XS, and so you can be sure that it is a top notch GPS watch. It has an impressive battery life that will make sure that you can go for three rounds on a single charge. This revolutionary watch is the best in its class and on top of all the other advantages that you get from it, you can always be sure of reliable and consistent performance. The few flaws such as lack of some hazards and bunkers or the cost do not take anything away from it. And so if you are looking for a GPS watch that will help take your game a notch higher, the Neo iON is perfect for you.